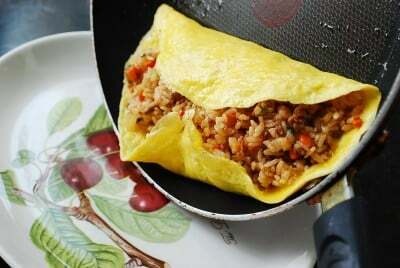 Omurice (오므라이스) is fried rice wrapped in egg omelette. 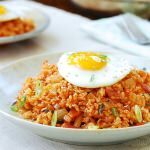 It’s a fusion dish that combines Asian fried rice with Western omelette and ketchup. 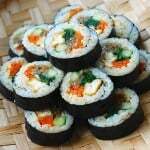 The dish started in Japan and spread to other Asian countries, including Korea. 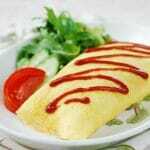 In the 1970’s, 80’s, and 90’s, omurice was a popular menu item in Western-style cafes in Korea. Today, omurice is commonly found at fast or snack food type restaurants. 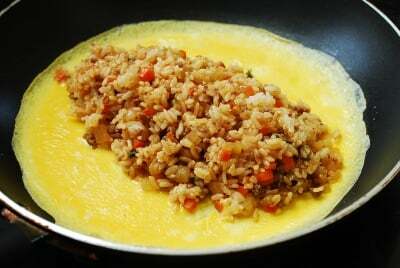 A few years ago, omurice gained spiked popularity after appearing in a Korean drama called Rooftop Prince (옥탑방 왕세자). 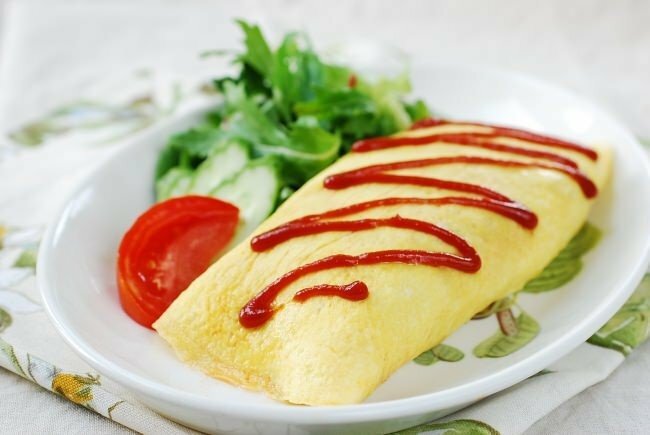 Flavored with sweet and tangy ketchup, omurice is especially popular among children. Growing up, ketchup was an exotic condiment we all loved! So, this ketchup fried rice wrapped in an egg omelette always was a special treat. 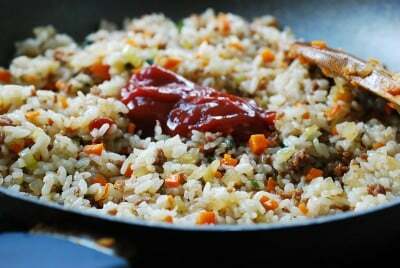 If you don’t favor ketchup in fried rice, it can be omitted. 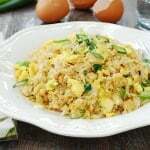 The fried rice will still be delicious inside the soft egg omelette. Likewise, you can increase or decrease the amount of ketchup to your liking. As is the case with any fried rice, use day old rice if available. If you need to make fresh rice, make it slightly drier by using a little less water than usual. It also helps if you rinse the rice well by vigorously swishing around with your hand. This washes off the starch on the surface of the rice, so the cooked rice won’t be as sticky. 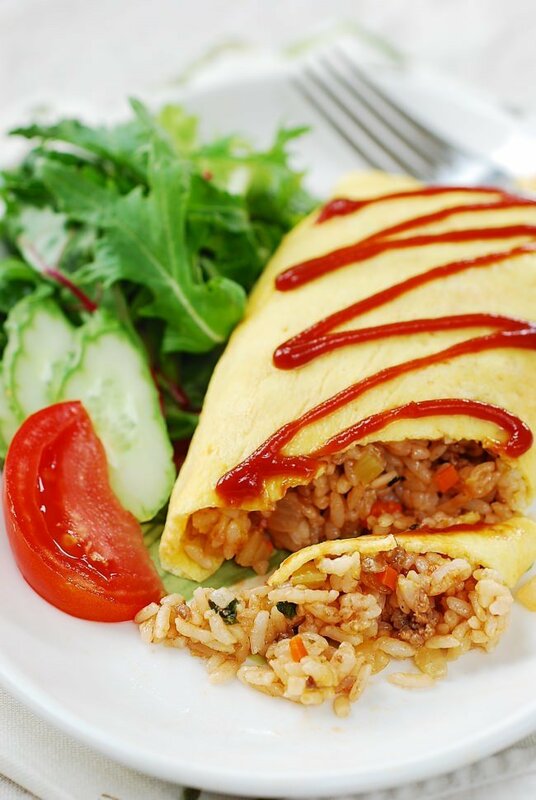 Japanese omurice is typically made with chicken, but Koreans commonly use beef, pork or ham as well. Shrimp is another good option. For vegetables, I used carrot, onion, and scallion. You can also add a couple spoonfuls of chopped celery, zucchini, or mushrooms. I used 2 eggs per serving for this recipe, but you can use 3 if you want a thick omelette covering your rice. You can also add a little bit of heavy cream or milk for a softer omelette, but I didn’t include it in this recipe. 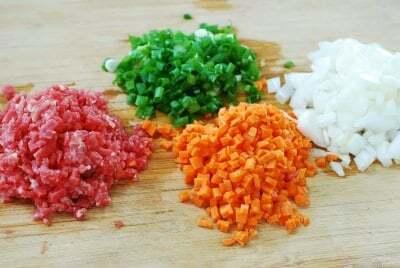 Prepare the fried rice ingredients by finely chopping them. Heat a large skillet over medium high heat with 2 tablespoons of oil. 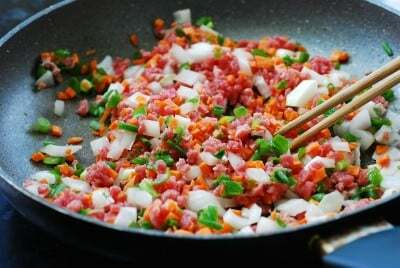 Add the onion, scallion, carrot, and beef, and stir fry until the onion turns soft and the meat is cooked through. Stir in 1 tablespoon of soy sauce and salt and pepper to taste. Reduce the heat to medium. 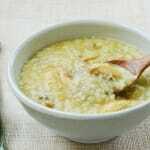 Add the rice, and stir well until the clumped up rice is broken up and all the ingredients are well combined. Add 1-1/2 tablespoon ketchup and salt and pepper to taste, and continue to stir until the ketchup is evenly incorporated into the fried rice. 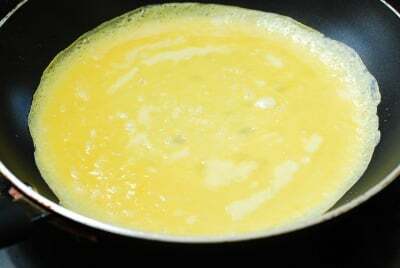 Transfer to a plate if using the same pan (non-stick) for the eggs. Crack and beat 2 eggs in a bowl with a spoon or a fork. Stir in a pinch of salt. Heat a lightly oiled small non-stick pan over medium low heat. Add the egg mixture to the pan and swirl it around to cover the pan. 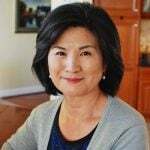 When the bottom is set but the top is still runny, turn off the heat and add one serving of the fried rice in the middle of the egg omelette. Using a spatula, fold both sides of the omelette over the rice.Push the whole omurice to the side of the pan. Flip it onto a plate. 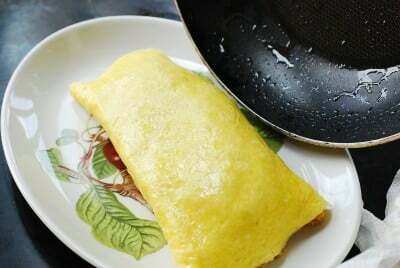 If desired, you can shape the omurice by hand using aluminium foil or a paper towel. Drizzle some ketchup on top. Repeat the last 3 steps for another serving. If the rice is a bit too hard after being in the fridge, heat it up in the microwave to soften it a little. This recipe is amazing! I only changed the meat for some fresh mushroom and the result was delicious! Me and my family enjoyed it very very much! I’m a novice cook and I could follow the recipe without any issues. I made omurice with shrimp. It was incredibly delicious!!! <3 Thank you for the recipe! That’s so great to hear, Irena! You made my day. Thanks for taking the time to leave me the feedback! It really means a lot to me. 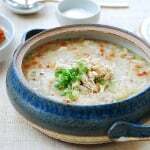 When I was stationed in Korea in 1978 to 1979, we all would go to the village to order this. 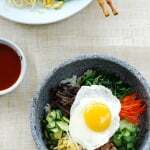 I’ve been trying my best to find a Korean restaurant here in the states that can make this for me. It is out of this world good. I see, but this typically is not on the menu of Korean restaurants in the states. Hope you try to make it at home. I’ve been a fan of Omelettes for the better part of 50 years. As you mentioned, I first can across Omurice with Rooftop Prince. Your recipe is quick, simple, and makes for a tasty rendition. Thank you. Thank you, William! I think a lot of people did. Enjoy! I’m really glad to have yet another tasty treat that combines eggs and rice… My favourites! 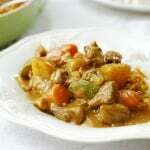 Thank u so much for the recipe…it was really wonderful…. Hi I’m Jenny. Me and my dad have been trying to make your recipe but keep messing up. We would watch it on YouTube but I’m algeric to many of the ingredients that they use. I almost gave up until I found your recipe. Can you make a video of how to make it so we won’t mess up? And what size pan should we use? I’m really hoping to start doing videos soon. A medium to large size pan. Keep trying. Like everything else in life, you’ll get better with more practice. Cheers!